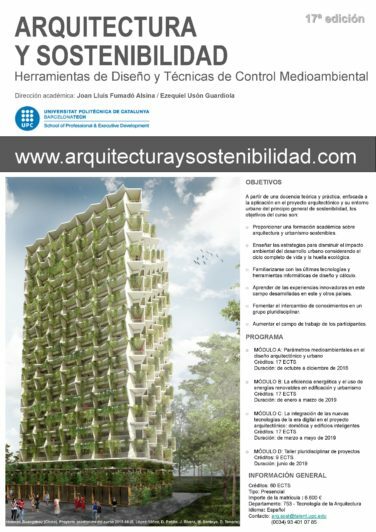 To provide academic training in Sustainable Architecture and Urbanism. To teach strategies for reducing the environmental impact of urban development, considering the complete life cycle and ecological footprint. To make students familiar with: the latest technologies; the technical and computing tools used for calculation, evaluation and design to achieve greater energy savings, and; the different energy certifications currently used across the European Union. To help students learn from innovating experiences in this field which have been developed both in Spain and in other countries throughout the world. To foster the exchange of knowledge within a multidisciplinary group. To increase the scope of the professional field in which the course participants can work and to provide them with skills that will be highly valued in the management and administration of projects related to the use and application of new technologies in architecture. On finishing their Master’s Degree, the students who complete all of the different assessments satisfactorily will receive the diploma corresponding to the Master’s Degree in Architecture and Sustainability which is awarded by the School of Professional & Executive Development of the Universitat Politècnica de Catalunya (UPC – Polytechnic University of Catalonia) of Barcelona. Professor Joan Lluís Fumadó Alsina Doctor in Architecture by the Escola Tècnica Superior d’Arquitectura de Barcelona (ETSAB – School of Architecture of Barcelona) and University Professor of the Department of Architectural Constructions of the UPC. Professor Ezequiel Usón Guardiola Doctor in Architecture by the ETSAB, Master in Intelligent Buildings and Sustainable Construction (MEICS) by the Universitat Ramon Llull (URL) of Barcelona, Master in Urbanism by the Instituto de Estudios de la Administracion Local (IEAL), Technical Director of the UNESCO Chair of the Universitat de Lleida (UdL), Professor of the School of Professional & Executive Development of the UPC.